Tommy sat down at the table and looked at his plate. There was meat on it. It looked a lot like his father’s plate. His father had meat on his plate, too. If there was ever meat in the house, it was on his father’s plate. Never on Tommy’s, until today. Tommy’s three younger brothers were looking at the meat on his plate, too. They did not have meat. They did not even have plates. They had each been given a bowl of gray paste. Mélange, his mother called it. She used to speak French before she married Tommy’s father. She doesn’t speak French anymore, but for most of his twelve years, mélange was what Tommy ate for dinner. The fancy name did not make it taste any better; the name didn’t give it any taste at all. Tommy’s brothers stared over their bowls of mélange at the pieces of meat on Tommy’s plate. “Your brother became a man today, boys,” said his mother. “You know that. When you go to work in the mine, when you are men, there will be meat on your plate, too.” She understood the ache in their bellies, an ache that was doubly in her own because she felt the emptiness in theirs and hers. His father dropped his arms to the table rattling the cups and bowls. “I just meant that he started work, Joe. That’s all.” His mother used a placating tone to fend off the explosion of temper that usually came around this time of day. A time after the sun had been down long enough for the bottle to be nearly drained of its brown liquid. Tommy looked down at his hands. He had scrubbed them before he sat at the table. The black coal dust was nearly gone, but his fingers still oozed blood from the cuts. Tommy became a breaker boy today. He sat all day on a narrow wooden board with his legs splayed over a moving belt of coal fresh out of the mine, picking out rocks and slate and tossing them aside. The belt moved fast and sharp pieces of rock sliced his hands open. He sat hunched over that belt from before the sun came up until the last coal car came out of the mouth of the mine. He was no miner, he knew, but he wanted that meat. He’d been wanting that meat since before he knew what wanting was. He lifted a fork with a bit of meat on the end and looked up at his father. His father’s eyes were rimmed red. From coal dust, perhaps. From drink, maybe. From the tears that traced down his face, probably. Today, his father had dug more than coal. He dug a grave. In that grave went the body of his friend who had the bad luck to be working under a weak spot in the roof of the mine. A slate fall killed Dan. A chunk of slate as big as an iron frying pan dropped out of the mine roof and Dan was under it. Now Dan was not sitting at his dinner table with his wife and children. Dan was wrapped in the cold ground where Tommy’s father had lowered him. Tommy put the meat into his mouth and closed his eyes. 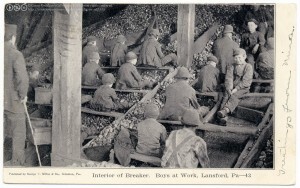 This, this was his reward for having lived twelve years to start work as a breaker boy. This bite and there were a few more, every night from now on. A sharp crack split his ears. He opened his eyes with a surprise that outweighed the sudden pain. His older sister had slapped him. Sally sat next to her father in a red rage that could not be matched by anyone Tommy knew except his father. Sally had mastered the art of anger. It was an anger that would turn to sorrow over the years for having lost her right to choose her life. For in two weeks, Sally would be married to a man as old as her father. A man who had lost his wife and who had two small children that needed tending. Sally would tend them and lose her youth in the bargain. “You’ll have meat enough when you marry,” said his mother. “I’ll not have this behavior at my table.” Tommy’s mother sat up, her back ramrod straight as she tried to create the impression of the woman she thought she once was. Tommy’s father stared at his now empty plate. His eyes filled with fresh tears. His fingers tightened around the fork and his other hand balled into a fist. His fist landed hard on the table. “And tomorrow, I will go back into the mine.” Tommy’s father stood and left the table. His mother’s shoulders slumped. His sister fingered a hole in the sleeve of her calico dress. Tommy finished his meat. The little boys sat with spoons in their bowls of mélange surrounded by silence. Chuck Wendig’s Friday Flash Fiction Challenge over at www.terribleminds.com. Life is hell in 1,000 words. 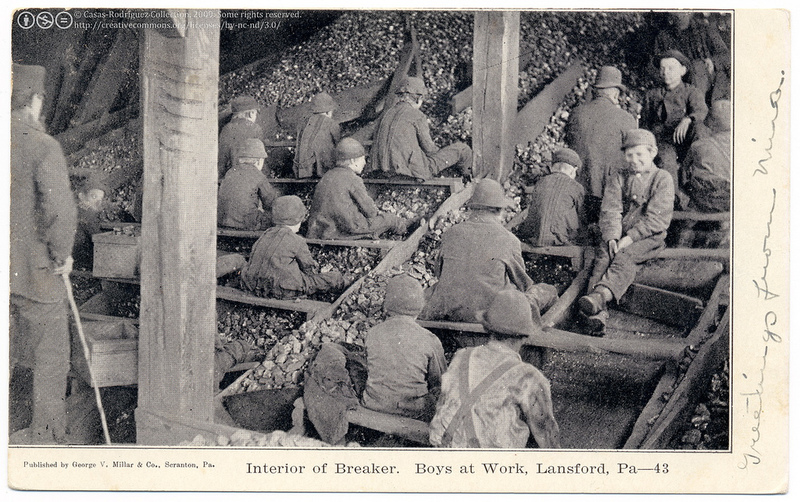 This story is part of an exploration of life in the coal camps in the early 1900’s.